STARCRAFT LIMITED 20 DECK BOAT - NEW 2015 WITH ALUMINUM TRAILER PACKAGE! JUST DISCOUNTED TO SELL FAST! NEW 2015 20' LIMITED 2000 DECK BOAT Whether you crave performance, comfort or fun, this Limited 2000 I/O Deckboat by Starcraft has it all. This 20’4? deck boat gives you basically three boats (ski boat, run about and pontoon boat) into one awesome boat package for a great deal. With a 12 person rating you can entertain the whole family and some friends just like a larger pontoon boat and yet still have the performance and style of a sleek ski boat! There is an abundance of storage and cargo space to put all the safety equipment and the weekend gear safely away to leave the boat open for your comfort. Great performance, outstanding fit and finish, tons of open comfortable interior space, luxurious interiors and great price points make the 2015 StarCraft 2000 Limited Deck Boat the best choice on the water! Great financing available on this package. Call Scott with any questions at 330-644-5020! Length: 20’4?' Beam: 8’6? Fuel Capacity: 51 Gal Person Capacity: 12 Dry Weight: 2325 Custom Portage Lakes Package:Limited Sportstar PackageFull Coast Guard Safety KitCoverDepth FinderTransom Stereo RemoteAnchor KitExtended Swim PlatformPlatform Soft Touch MatSnap in Custom CarpetSST Bimini Top SetLED Cup holders & SpeakersPull Up CleatsFamily Fun SeatSST Rub RailFlip up BolsterTandem Aluminum TrailerMany more standard Features!WITH 4.3l MPI 220hp MERCRUISER ENGINE.CUSTOM PORTAGE LAKES PACKAGE PRICE NOW ONLY $35,985!EBAY SPECIAL OFFER!SALE PRICE NOW ONLY $33,500 OR BEST OFFER! This Cougar MTR 22 boat was built in Canada. 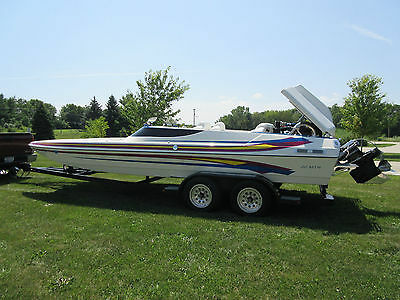 Comes with a 500 EFI Mercruiser motor with Mercruiser Bravo 1.50 gear ratio drive. Custom power steering, all custom gauges, controls, working stereo system and more. 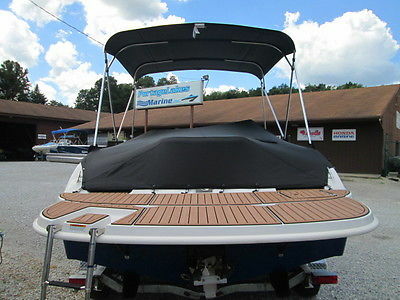 This boat is in really good shape and always stored in a inside. This is a very heavy duty built fiberglass hull. The interior is in good shape with one stain on the starboard back seat. This boat is currently at Kunkle’s Marine getting serviced from top to bottom to make sure it needs nothing. We are not servicing it, because we are mostly an outboard shop and do not have a lot of tools to check out the EFI motors. Compression and leak down is excellent and the motor is tight. This is a 90+mph boat. This boat is a lot of fun and runs over the rough really well. This boat has a lot of extras. To buy it new or a new boat similar would cost you over $125,000 now. The motor and drive in this boat is over $45,000 from Mercury. I also have two sets of exhaust tips for this boat. I have the pair that you see in the pictures which channels the exhaust under water while off plane and I have straight tips which are on it now. Both sets go with the boat and I will put on which ever you want. Top of the line aluminum and stainless steel hardware was used throughout this whole boat. Two new Optima batteries just installed. Comes with a Bravo 4-blade stainless steel prop. This is really good all-around performance boat. Can cruise, tube, ski and have something different than the rest of the crowd. Comes with a tandem axle trailer that will have new bearing installed for new owner. Tires are in good condition. 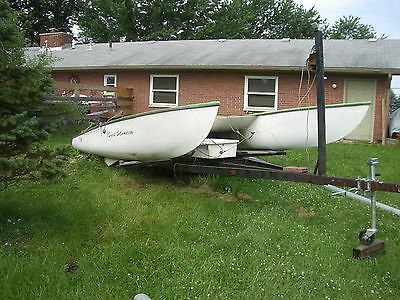 The reason I am selling it is I manufacture tunnel/cat boats talon22.com boats and wanted it to compare to our boats. Plus, I had no boat for the summer as I sold my personal Talon to a customer and I wanted a lake toy till I got another one built for me. Payment is due within 7 days of the auctions close time and a $1000 deposit due within 2 days of auction close. Titles free and clear and in hand. This is not a salvage boat either. Please call me with any questions at 937-292-7674 Todd.